This precious vineyard is part of the Gjergja family domain, which also includes Kooyong vineyard and winery, winemaker is Sandro Mosele. The 20 hectare property has glorious views to Phillip Island and French Island in Westernport Bay. The estate is located at latitude 38 degrees South at an altitude of 160m above sea level. The maritime influences together with the natural amphitheatre formed by the the north and north-east facing blocks provide an ideal environment for cool climate viticulture. The maritime influence at the vineyard is symbolised by the Blue Peter logo, a blue flag pierced with white, the international maritime code for the letter P.
Port Phillip Estate is planted to 8.7 hectares of Pinot Noir, Chardonnay, Shiraz and Sauvignon Blanc. It was established in 1987, and has rapidly gained a reputation in the industry for producing exceptional cool climate wines, brought about by attention to detail and the impeccably maintained vineyard. In this regard, advantage is taken of the site's unique 'terroir' and the essential ingredients comprising the right soil, the right grapes for that soil, the right climate, and the know-how of the winegrower and winemaker. Good wine is the result of a balanced vine, controlled yields and quality fruit. Under the management of third generation viticulturist Doug Wood, the Port Phillip Estate viticulture program produces low yield, high quality crops that display the flavour intensity of this exceptional site. The vines are all cane pruned and shoot thinned by hand. The handpicked Sauvignon Blanc fruit is whole bunch pressed. One third of the juice is transferred to old French oak barrels for fermentation with the remainder going to stainless steel tanks. The wine is fermented naturally without yeast additions. Once fermentation has ceased the wine is sulphured to prevent malolactic fermentation. Wine is assembled and bottled at approximately six months of age. Chardonnay is handpicked, whole bunch pressed and transferred to new and used French oak. The wine is fermented naturally without yeast additions. Once fermentation has ceased, the wine is sulphured to prevent malolactic fermentation. Our desire is to retain all the freshness of the naturally occurring acidity. The wines are not battonaged resulting in a finer more elegant wine. Up to 30 per cent new oak is used, the remainder being one to three year old barrels. All of the Pinot Noir fruit is hand picked and 100 per cent de-stemmed into open vat fermenters. The fruit is chilled to approximately 8-10 degrees and then allowed to warm up ambiently. Spontaneous fermentation occurs between four to eight days later. Cap management is via hand plunging as well as a computer controlled mechanical plunger. Once the fermentation is complete (between days 14 to 20), the wine is pressed and transferred to French oak barrels. Up to 30 per cent new wood is used and the wine is bottled after 12 months. The Morillon Pinot Noir is a specially selected parcel of fruit. This wine is made exactly the same way, but it is allowed to mature in oak for another six months. All of the Shiraz fruit is hand picked and 100 per cent de-stemmed into open vat fermenters. The fruit is chilled to approximately 8-10 degrees and then allowed to warm up ambiently. Spontaneous fermentation occurs between four to eight days later. Cap management is via hand plunging as well as a computer controlled mechanical plunger. Once the fermentation is complete (between days 14 to 20), the wine is pressed and transferred to French oak barrels. Up to 30 per cent new oak is used and the wine is bottled after 18 months. The Rimage Shiraz is a specially selected parcel of fruit. Both the Port Phillip Estate Shiraz and Rimage Shiraz are made in the same way. 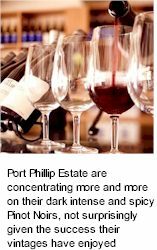 The winemaking at Port Phillip estate builds on the superb cool ripening conditions of Mornington to craft beautifully flavoured Burgundian offerings such as the Pinot and the fleshy buttery Chardonnays. Winemakers Dianne and Giorgio Gjergja have built on the reputation of the scarce offerings from this tiny winery to present limited editions of excellently balanced boutique wines.